While it’s hard to imagine bestowing the moniker Ralph on your baby boy, there is an appealing, dramatic twist on that sadly dated name that bears consideration: Raphael, and the breezy nickname Rafe. Thanks to Natalie for suggesting today’s Name of the Day. Say the name to a school-aged child and the Raphael that springs to mind is probably a turtle – a Teenage Mutant Ninja Turtle, to be precise. Like his fellow crime-fighting testudinates – Leonardo, Michelangelo and Donatello – he was named after a Renaissance painter, the Italian Raffaello Sanzio. Raphael is also an archangel, referenced by name in Judaism, Christianity and Islam. 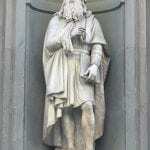 The Hebrew translation of his name means “God heals.” There have been two Saint Raphaels, both in recent times, and dozens of communities are named in his honor: Saint-Raphaël in France and San Rafael through the Spanish-speaking world. In fact, the influence of Spanish is significant. Rafael ranked #228 in the US Top 1000 boys’ names for 2007. Raphael, however, languished at a relatively obscure #705. Regardless of spelling, it is normally pronounced rah fye EL and the nickname is always spelled Rafe, with an f.
It’s worth noting that Ralph is not, in fact, related to Raphael in origin or history. However at least one famous Ralph – actor Fiennes – favors the pronunciation “Rafe.” There’s also a similar Arabic name, Raef, again not linked to Raphael or Ralph. What is certain is that the name is quite familiar throughout the world. Raphael is a Top 20 name in Quebec and Rafael ranks in the Top 50 in Spain. While the name has a romantic quality, it’s not quite as extreme as calling your boy Romeo. And the short form Rafe makes the three syllables easier to wear. If you’re hunting for a name with a certain pan-European flair and a long history of use, this is certainly one to consider. Thinking about this for a boy… Has anyone heard of the pronunciation RAY-fee-el? Would you still spell it Raphael? I prefer that pronunciation to Rah-fie-EL, and it’s easier to get Rafe from that. My son is Rafael and we call him Rafi 50% of the time. My husband was partial to the f spelling vs the ph. We love it’s cross cultural appeal and it’s romantic, yet masculine sound. In fact, we love it so much that we are having a very hard time coming up with another boys name to join Rafael and big sister Naima. We have tossed around Desmond, Simeon, Conrad? We just don’t love anything like we did Rafael. Ashleigh, I’ll post a Q on the Facebook page for you! I am in exactly the same situation at the moment. I have a son named Rafael, Rafi for short, and we just can’t come up with something that we love as much. It’s really tricky! 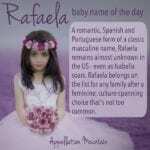 We considered Raphaella Bathsheba (Surname), for a little girl, despite it’s overly religious tones. The only reason we changed our minds was because Raphael in male or female form is quite predominant in Hispanic communities. People, upon hearing that it was a name we were considering, asked if we were Spanish/Hispanic, and we are not. So it lead to us changing our minds and scratching it off our list. I have to admit, it would be hard to imagine Raphaella on a Platinum hair and fair skinned child. My grandson is Raef I think it is a beautiful name for a boy a proper boys name when his name was announced it got a mixed response from family and friends but now everyone likes it also we had never heard of another child called Raef but since he arrived two people I know have had boys in there extended family and they have been called Raef/Rafe. I just hope it dosnt become to popular. I cannot get past TMNT. I do love the nn Rafe though. How’s about Rafferty? I agree that the TMNT association is something a lot of people can’t get past, but for me it’s not problematic because it’s not a negative association. Rafferty is nice, but it sounds too British for me. Also, I prefer to stay away from ‘y’ or ‘ee’ endings for boys. I think Raphael is the best way to get to nn Rafi and Rafe. I like Rafferty – and despite Jude Law using it for his son, I haven’t met one. Just thought to look for Raphael, how in the world did I miss him?!? Raphael’s a long time love of mine. Even as a kid, he was my favorite Archangel! Yeah, He’s a love all right, but still a long shot for me; the Mr. thinks he’s too religious for us.I think the point is moot, especially with boys who have Pope names! *shrug* If I get the chance to sneak it in, I absolutely will! I know a couple of little ones who bear that moniker, memorably one also has a little brother called Gabriel just like the archangels! While I would never choose Raphael – it’s just not me – I am quite fond of it. As for Gabriel – I love that! I am always in search of NotDs! At the moment, the calendar is filled through June 12 – but that’s a mere two weeks’ worth. Funny you should ask, because I was just trying to decide *when* to post another call for suggestions. But yes, either reply to the original post, or any NotD post really. As for St. Raphael’s, we actually belonged to a St. Raphael’s parish a few years ago. I called it St. Rafe’s – which my husband thought was quite irreverent and possibly soul-damaging. So far, I have not been struck by lightning. St. Raphael of Brooklyn has a really quirky rhythm to it, doesn’t it? Love it! Oh no! The secret’s out! […] Oritz welcomed a son named Rafael, a little brother for Paloma Louise.